John Dewey’s above quote is so important as we begin to address both the facts and thinking that abounds in our standards. For the past ten years it seems we have concentrated our efforts on the facts and have not spent enough time in the thinking.. or as I like to think “doing”. A portion or foundation of a curriculum is the standards. Standards make up the general knowledge of what educators want students to know. Standards are a great starting point and through careful examination, exact content and skills can be aligned with technology integration. Simply stated, examining or unpacking a standard allows a teacher to see what a child will know and be able to do. It can also help educators determine what digital resources may work best to help support learning. Now, the phrase “unpacking the standards’ may not bring out the smile you want from teachers. For this reason I will refer to it as finding the technology in the standard. If you wish to have a copy of my free “Unpacking Standards for Technology Integration Form”… Download… unpack_standards_mjgormans… and remember to give credit! By examiing the content appropriate nouns in the standard it is possible to identify key concepts that students should learn about and show an understanding of. While all areas of Blooms can be applied for deep understanding, a good starting point might be the areas of Blooms regarding understanding and remembering. Please note that the higher levels of Blooms can help foster learning in these two areas. By idenifying content appropriate nouns it is possible to search for both resources available at a school district along with some amazing free resources found on the web. I hope Dewey’s quote provides a whole new way to look at and examine the standards by using a lens of technology. While the nouns can help locate the important content that can be supported with OER (Open Education Resources) , it is the verbs that will take your students into Bloom’s higher order while conquering the 4C’s. Take a moment to check out the wide assortment of possibilities found in the below links. You will discover a whole new world of technology ready to put those content standard verbs into some exciting and engaging action while going beyond the technology shine. How might your identification of the curriculum standard nouns along with OER fit into a classroom ? You will never know until you begin your exploration. 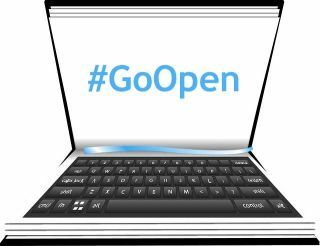 The links below provide you an opportunity to learn more about Open Education Resources. Please enjoy and share with others. Send me some others that I should include in a future post. The Index of Open Educational Resources– Open Educational Resources come in many shapes and sizes. This partial list of sources introduces the scope of OER and the organizations cultivating its increasingly vital role in opening higher education up to the greatest number of people worldwide. Open Education Resources– Talk about big, this network brings together 44,129 OER tools for sharing curriculum. It also provides a host of world and news and training on the amazing arena of open education! Great place to investigate whether you have an hour or a month! CK12.org – Imagine creating your own textbook. Better yet, think about a wonderful base of a textbook that is already created, vetted, and matched to standards. Now, what if you could add to it, localize it, widen or deepen scope, and individualize it for your students’needs? Best of all, what if you could now make it your own and share it with your students? It is all possible with CK-12. This wonderful OER makes it easy for teachers to assemble their own textbooks. Content is mapped to a variety of levels and standards including common core. Teachers can start from scratch or build from anything in the FlexBooks library. Curriki– What happens when classroom teachers from every country in the world take part in a global community of sharing curriculum and best practices? You can imagine that teachers are empowered to create extraordinary learning experiences for their students. As Curriki states, “Barriers to equal access to education begin to lift—geography and politics become immaterial. And the economy benefits from a highly educated population.” That’s the basis of Curriki, a nonprofit K-12 global community for teachers, students, and parents to create, share, and find free learning resources that enable true personalized learning. It is their mission that free and equal access to the best curriculum materials is possible. Take some time and explore how Curriki is leading the way. Concord Consortium – What an amazing place for those individuals working in STEM Education. At Concord Consortium you can help your students learn with hundreds of interactive, research-based resources covering a huge variety of science, engineering, and math topics. You will note that many activities let the teacher see assessment results after student completion of an activity. This allows for outstanding formative learning and assessment which makes alignment with lessons quick, easy, and rewarding! Wikipedia – Not only does Wikipedia have awesome vetted content, it also has a way educators can make their own books with Wikipedia Content. These books can be distributed in numerous digital content, or printed as hard copy. It is a great way to put significant content on any LMS. For articles with easier reading possiblities check out Simple English Wikipedia… and yes it is still possible to make a free book. FreeReading (pk-3) is a free, high-quality, open-source reading program addressing literacy development for grades K-3. Leveraging the collective wisdom of researchers, teachers, reading coaches, and other education and industry professionals, FreeReading provides a high-quality, cost-effective alternative to static materials. By establishing a foundation of hundreds of research-based lessons and materials that users can download and use for free, FreeReading has created the framework for intervention programs supporting K-6 literacy. The collective wisdom within FreeReading is invaluable and can be more beneficial than any one reading program..
MERLOT – This is an organization that states its mission, “Putting Educational Innovations Into Practice.” At this site you will find peer reviewed online teaching and learning materials. Share advice and expertise about education with expert colleagues. Best of all you can be recognized for your contributions to quality education. Take some time to take a look! OpenStack – As stated in the title… an awesome place to connect with free and open source lessons! This site allows you to view and share educational material made of small knowledge chunks called modules. These chunks can be organized as courses, books, reports, etc. Open Course Library – A collection of high quality, free-to-use courses that teachers can download and use for teaching and learning. All content is stored in Google docs. This makes it easy to access, browse and download for use anytime, anywhere, regardless of connection. Wisconsin Online Learning Objects – It is so true, learning objects add flexibility to the teaching and learning experience. In this site teachers have the opportunity to use learning objects when teaching a basic concept, applying concepts in “real world” applications, checking and testing true learning, providing understanding through simulation, and giving essential remedial instruction. Vision Learning– This organization has developed a set of peer-reviewed materials for learning science including modular readings, interactive multimedia, and a glossary. Best of all, it is available for free on the web in both English and Spanish. Note that as emphasized in the Next Generation Science Standards, Vision Learning emphasizes science as a process, not just a collection of facts. You will find that these resources can be used individually by anyone and can also be combined and customized within online classrooms by teachers. Community College Consortium for OER– The Community College Consortium for Open Educational Resources (CCCOER) is a combined effort involving individual community colleges, regional and statewide consortia, the Open Courseware Consortium, the American Association for Community Colleges, the League for Innovation in the Community Colleges, and many other educational partners. The mission is to develop and use open educational resources, open textbooks, and open courseware. It is the desire of CCCOER to expand access to higher education and improve teaching and learning. NROC – Take a moment to visit a place that truly rocks! You will find it at The National Repository of Online Courses (NROC). Here you will discover a growing library of high-quality online course content for students and faculty in higher education, high school and Advanced Placement. For all of you Hoosiers… NROC is provided to you free in the state of Indiana by the DOE. Flat World Knowledge – This is a website that is authored by the industry’s top authors. These textbooks are helping improve teaching and learning at more than 2,500 leading colleges and universities worldwide. Hippocampus – This is a project of the Monterey Institute for Technology and Education (MITE). The goal of HippoCampus is to provide high-quality, multimedia content on general education subjects to high school and college students free of charge. If this fits in your budget than be sure to visit a discover a wide selection of excellent lessons, inter actives, and activities. Georgia Virtual– You will find a wonderful collection of resources from the Peach State. The content available on this Shared Resources Website is available for anyone to view. Courses are divided into modules and are aligned with the Georgia Performance Standards. Moodle Exchange– Shares Moodle courses and other content useful for Moodle teachers. Open Source Physics Project– Physics teachers will measure a great equation of material. This wide range of curriculum resources both involve and engage students in physics, computation, and computer modeling. Khan Academy – One cannot forget the Khan Academy. The Khan Academy states a desire to provide “free world-class education for anyone anywhere.” Perhaps the academy is best known for its collection of over 3,000 videos covering K-12 math and some topics in science, history, business, art history and test preparation. Please note that Khan is going beyond Math. There are also more than 300 practice modules contained in the Khan Knowledge Map. This map orders the learning modules by concepts.. Educators and students can view a wide variety of data in regards to student progress. Free Bloom Posters – The Orange and The Butterfly. You may need to scroll. Blooms Technology Wheel and Knowledge Dimension – Wonderful interactive Site pointing to great tools. Flash based. Common Sense Media – A wonderful teacher vetted tools. As you can see, the standards are an important part of technology integration. As educators examine the many relevant nouns and verbs found in the standards they are able to focus on real learning. It is this focus that allows today’s 21st century classroom to go beyond the SAMR and the technology shine.